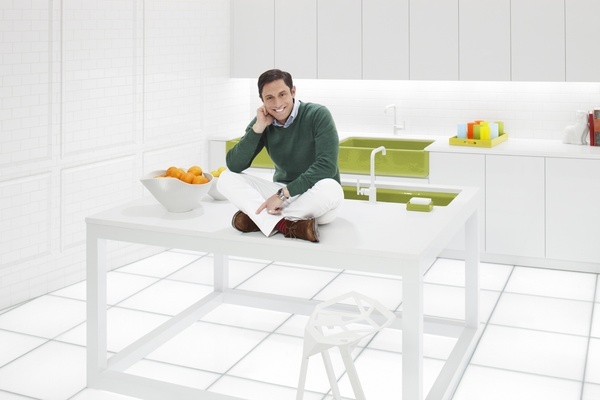 Jonathan Adler has teamed up with Kohler to release a line of sinks in his signature style...bold and colorful! These Limited Edition 4 colors are offered in six of Kohler's enameled cast iron sinks. For the Kitchen the models are Whitehaven, Riverby and Iron/ Tones. The Bath models are Tides, Canvas, and DemiLav Wading Pool. Colors: Piccadilly Yellow, Greenwich Green, Palmero Blue & Annapolis Navy. The sinks retail from $295 – $1795. • Annapolis Navy: "Annapolis Navy epitomizes nautical chic. It's such a classic color because it pairs so well with other bold colors." • Greenwich Green: "This is not dull avocado green. It's bolder, yet timeless. So crisp and refreshing you can taste it." • Palermo Blue: "A nice, crisp light blue is cool and refreshing, like taking a dip in the Med itself." • Piccadilly Yellow: "There's a very mod quality to Piccadilly yellow, especially when paired with white. It's unexpected and will always feel fresh." My personal opinion: I LOVE the colors, they are so... HIM. But are they me? Or you? Possibly. I'd definitely use any of the four colors in a bath. I think paired with white quartz it would be a fun focal point in a Powder or Kid's Bath. The price point is fair and actually lower than I thought it would be. I'm excited for this line of sinks and hopefully we'll have a client bold enough to use one!